The following chapter investigates an emerging shift in the corporate world that is now more often than ever engaging with the global community of users. Collaborative, open business models promoting user-driven, open innovation strategies are adopted, one of them being framed as crowdcasting - specific crowdsourcing model where corporations broadcast their challenges to a targeted community. A crowdcasting model in the shape of an online ideas competition is demonstrated as a mean of fostering open innovation. In the case study we present Challenge: Future, a student competition that is build upon an online platform adopting crowdcasting principles. Looking at the development, main features of the competition platform, and means of interaction with its user base we present benefits for all sides involved. 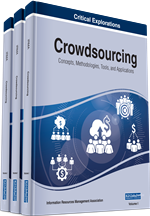 Further on, the chapter tries to elaborate the ways how crowdcasting models could benefit by tapping even deeper into the new social networks and exploring their potential. It seems that since the emergence of the Internet we are witnessing constant social changes. This is how the information age in which we are living today started. Since the Internet reached its critical mass in the 1990s, changes have become more frequent and nowadays it seems that the academics, futurists and other authors are competing while introducing new terminology for the ongoing changes. The era of the Internet is framed as the Networked age, marked with the global community connecting in and out of the network. But the beginning of the 21st century starts mankind’s next revolution in delving deeper into the information age (Ahonen & Moore, 2005). We move beyond physical connectioning and start engaging with the network seamlessly and ubiquitously. We speak about the shift into Connected age that is enabled by the Internet (Zelenka, 2007). Constant connectedness, availability, mixing of public and private, and trust in the virtual community are some of the attributes of the new era. Change in the mindset is a major one. We learn to search, produce, share and interact in a new way (Ahonen & Moore, 2005). Companies and organizations need to be aware of the constant changes and accept the need to adapt in order to thrive, or even survive on the market. People have started using technologies and networks available to get relevant information among themselves, rather than reaching towards companies. Years ago, when the Internet “review communities” sprung, companies saw them as a threat. Yet, today some corporates invest large portions of their budgets into nourishing such internal and external communities as they provide valuable information. The latter shows that the shift is happening, though most corporates are engaging with the community without a proper strategy and with the existing conventional thinking. Prerequisite for successful new product development (NPD) is acquiring information from (potential) customers about their needs and preferences. Corporates dedicate vast amounts of resources identifying those needs. Dominating measure to access this information is still market research (Piller & Walcher, 2005). No matter the vast amounts spent for market research, new product success is often the exception rather than the rule. Henkel & von Hippel (2005) think that not even highly sophisticated conjoint measurements or concept testing performed change that fact. That is why corporates are seeking new ways of acquiring information. From well run one-way systems of launching products and services, while co-creating customers needs, they are opening towards the users. From “push” models, where content is produced and delivered, we witness a shift to “pull” models where content is co-created with the help of users. Seeking interaction and user feedback is becoming important, even more, taken under consideration. However, opening towards user community, involving users to participate in the development processes is a major change for companies and organizations. It presents a big step away from existing strategies that are based on building a strong, confident brand relying on internal resources (e.g. employees, management, and research data). For most corporates opening equals exposing its processes to the competition or general public. Because they still use the conventional mindset, some corporates think admitting they are facing a challenge, means exposing its weak spots. Another reason for not opening is keeping its innovation process in secrecy. Therefore, those corporates rely on internal innovation. They see the innovation process as an internal activity (Chesbrough, 2005). But the problem with internal research and problem solving is narrow-mindedness, even if the company may have a pool of brilliant researchers and experts at their disposal. The solution space is reduced to sources known to the company or organizations. Burgeoning literature with authors such as Chesbrough, von Hippel, Henkel, Piller, Walcher, Tapscott and others is addressing those corporates and urging them to find new ways of opening the innovation process to the input of external sources (Piller & Walcher, 2005).